​​Use the link above to access the webinar room starting 15 minutes prior to the webinar start time. Enter the webinar as a guest by typing your name in the name box and click the “Enter Room” button. ​Join us as we discuss what is a “Sustainable Urban Forest” and how do we measure the indicators and success. Several years in the making, this comprehensive and widely anticipated guide was finally released at the Arbor Day Foundation Partners in Community Forestry Conference last fall. 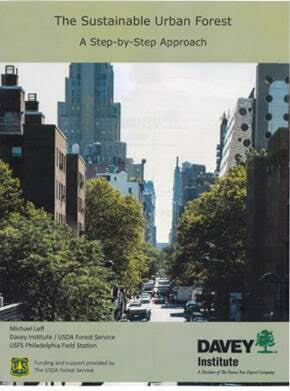 Developed as part of a collaboration between the U.S. Forest Service and the Davey Institute, the free handbook is designed to help urban forest managers assess the state of their urban forest, identify issues and opportunities, and chart a path toward long-term sustainability. It presents a scalable approach that can be adapted by any “community” that seeks to pursue a similar path in its realm of responsibility. This could include a county, city, park district, conservation district, university or corporate campus, homeowner association, or any other such entities. An updated self-assessment method, based on the pioneering “Model of Urban Forest Sustainability” first developed by Jim Clark and colleagues in 1997, forms a cornerstone of the guide. The assessment tool enables users to set goals and track progress on numerous targets within three broad categories: Trees and Forest, Community Framework, and Resource Management Approach. This webinar will provide an orientation to The Sustainable Urban Forest, and demonstrate how the guide overall and self-assessment method in particular can form the foundation for a successful urban forestry program. Use the link above to access the webinar room starting 15 minutes prior to the webinar start time. Enter the webinar as a guest by typing your name in the name box and click the “Enter Room” button. Continuing Education Credits: One Continuing Education Credit for Landscape Architects; Society of American Foresters (CFEs); and PLNA Certified Horticulturalist (PCH) will be offered to attendees. International Society of Arboriculture (CEUs) will be awarded with 80% score of quiz return. Certificates of attendance will be provided after the program.